Before you begin installation, identify areas that have similar watering needs (i.e trees and shrubs, ground cover and flower beds or gardens, potted and hanging plants). After identifying those areas, you should decide on a water source for your micro irrigation system. You may choose a standard hose faucet, an existing underground lawn irrigation system or it can be directly connected to a sprinkler system valve. You will also want to check the water pressure of your water source as well. Drip watering systems operate best at a water pressure between 15 and 35 PSI. 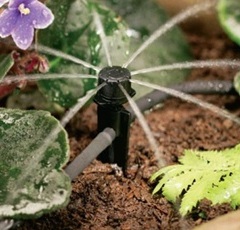 Any higher water pressure could damage your garden watering system or cause it to fail.